I've been wanting to write this post for a while now. 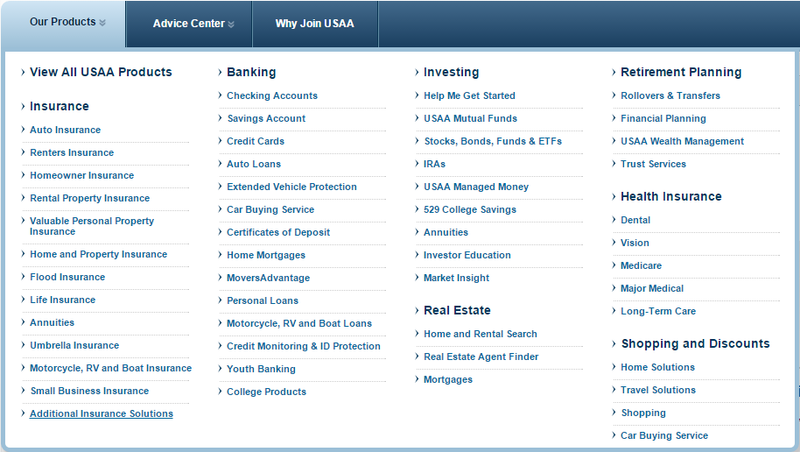 I've been a member of USAA for over 10 years and I've tried almost every one of their products. I've used their car and home insurance, banking, investment services, loans, and credit cards. They also offer flood insurance, life insurance, and over 40 other products. I have a picture at the bottom of the blog post with all of their products if you are interested. In the last 5 years I've lived in Colorado, Arizona, Utah, and Oregon. I always compare insurance rates between the major competitors in each area. The top two are always USAA and Geico. USAA has been the cheapest in 3/4 locations. What I like about USAA Auto Insurance?? While you are deployed or on TDY you can put your car on "Storage" which means you keep the policy but only pay like a $1/month while it is in storage. I did this for 3 months while on TDY's because my wife has a car also and no one would be driving my car while I was gone. I saved over $100+. I started out with all my investments with USAA. I had most of my money in the S&P 500. Then I realized that the expense ratio at USAA was 0.25%. The expense ratio at Vanguard for the same fund is 0.05%. That means that USAA is 5x more expensive! This is obviously because vanguard manages over 3 trillion dollars while USAA is only in the billions. They also charge like $8 to make a stock trade. Thats outragious when it only costs them 0.001 cents to make the trade. I recommend newer platforms like Robinhood, Loyal3, or Motif Investing . Some people like having all of their accounts in one place. If this is you, than USAA is your best bet. I don't know of any other company that offers every single financial need you could ever have. I've used USAA Renters Insurance before and their rates are very competitive. Their rates start as low as $12 a month for $2,500 in personal property coverage. Here is my experience. I bought a used car and applied for an auto loan through PenFed and USAA. Both were advertising rates for used cars for 1.99% for 36 months. I applied for both and PenFed approved me for the offer while USAA approved it but raised the rate to 6.99%. I have great credit, I think my score last time I checked was in the 790's. Ever since that I been weary of USAA Auto Loans. USAA has a couple of great Credit Cards. My favorite is the Cashback Rewards Plus American Express. This card gives 5% back on Gas and 2% back on Groceries. It has no annual fee. They also have a card that gives 1.5% cash back on every purchase. This is better than 1% but not as good as the Fidelity Card or the Citi Double Cash which both give 2% back on every purchase.